Avengers: Infinity War might have been released back in April, but its affects are still very much a mystery. With Josh Brolin’s Thanos wiping out half the galaxy with the snap of his finger, the entire MCU as we know it is in a state of unrest. Which characters faded to dust? Which are surviving in the wake of that mass extinction? How the hell with the franchise continue if half the heroes are dead? There’s a lot to ponder while we patiently wait for Avengers 4, although plenty of actors have put their two cents in about their characters. This includes Thor: Ragnarok’s Tessa Thompson, who recently posted to Twitter to remind everyone that Valkyrie is alive and well in her mind. That’s right. While Asgard and half the galaxy may be gone, it looks like you can’t keep a good girl down. So Valkyrie is still doing her thing– far away from the awesome power of Thanos. 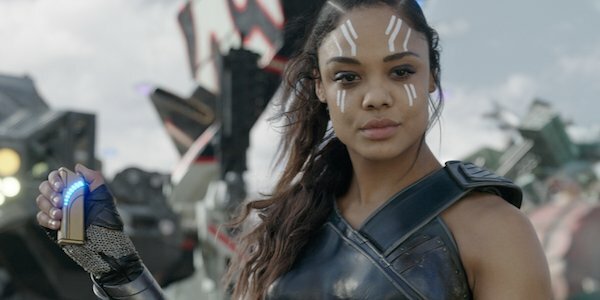 Tessa Thompson’s recent Tweet is funny, but addresses a question fans have been asking since Avengers: Infinity War arrived: what the hell happened to Valkyrie? Valkyrie made a badass debut in Thor: Ragnarok, portraying a complicated warrior with a sordid past and drinking problem. She eventually faced her trauma and helped to bring down Cate Blanchett’s Hela, departing Asgard as it was destroyed alongside the rest of the heroes and a bunch of Asgardians. Avengers: Infinity War picked up almost immediately, showing that Thanos had killed everyone on board, leaving only Thor, Hulk, and Loki in his wake. Valkyrie and Taika Waititi’s character Korg were neither seen nor mentioned, so fans wondered if they were even alive. The odds got even worse when the finger snap of death happened, but Tessa Thompson has always maintained she escaped the ship, and also evaded the snap. Talk about a survivor. Valkyrie’s future in the MCU is a mystery, as it’s unclear if the Thor franchise will come to an end when Chris Hemsworth’s contract comes up after Avengers 4. If there’s no more Thor, it might be difficult to work Valkyrie back into the narrative. Unless Tessa Thompson gets that all-female movie she’s been hoping for. More will be revealed when Avengers 4 arrives in theaters on May 3rd, 2019. In the meantime, check out our 2018 release list to plan your next trip to the movies.